Is it really kind of mean to completely ignore a pair of bright blue, three-year old eyes begging you for a little ride on the swings? I was at the park this morning, and I got a little irritated by these two moms who kept ignoring Brooklyn. I was feeding the baby using my handy-dandy nursing cover-up at a park bench nearby, so I was unable to help her out myself. She even asked them, "can you push me?" but was totally ignored. 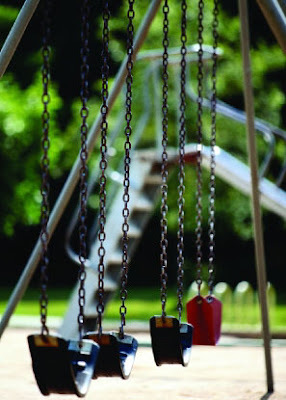 The two girls and their moms then moved over to the tire swing, a three-seater. Again, Brooklyn stared and watched. I felt so bad! Mind you, Brooklyn had just TICKED me OFF a mere moment before this incident, but suddenly I was her greatest advocate. After a few minutes, one mom walks over toward me where her stroller was parked. Brooklyn followed the woman, hoping still to gain her attention. As she followed her, the other lady back at the tire swing said to her friend, jokingly, "Look, you have a shadow!" Clearly, it was not as though either of the women has simply not noticed Brooklyn. Finally trying to muster all the self-control I could, I said, "I think she wanted to get on the swing with the girls." To which the woman replied "Oh, I would have put her on, but I have to keep my hands free to watch this one." She was referring to the 18-month old running around in the sand totally content by herself. It wasn't as big of an insult as I am making it out to be, I am sure. I easily could have pushed my child after feeding the baby. However, by that time we were both done with the park. Later that afternoon we visited another park and I pushed Brooklyn on the swings along with another little girl who we had just befriended. I felt better. Now onto a more positive post! Wow I can't imagine anyone being so mean to a little girl. Please how hard is it to push another child when you are already standing there--and if they needed permission you were obviously giving it with your comment. I would have to say reading about what happened makes me very cranky!